The Price is Right has been on the air for a long time, but even now that Drew Carey has capably replaced Bob Barker, there’s at least one thing that hasn’t really changed about the show over the years: its audience. The daytime syndicated show airs between a lot of soaps and talk shows on weekdays, so it’s no surprise that it’s well-liked by sick kids staying at home for the day. 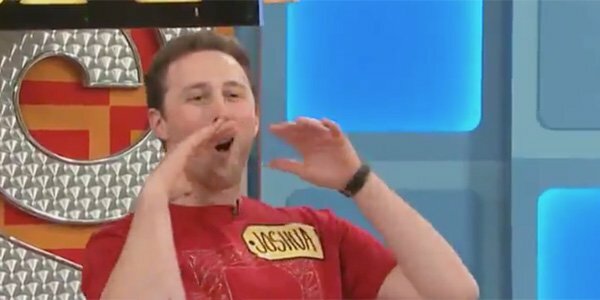 Recently, a man gave a huge shoutout to all the sick kids everywhere who ever watched the Price is Right just before giving us an epic spin. Check it out, below. Recently, Price is Right contestant Joshua George made it to the Showcase, where he was given the opportunity to spin. After spinning, obviously there’s an awkward amount of time where the wheel is just going and going… and going… and host Drew Carey asked Josh if he wanted to give anyone a shoutout at home. Instead of nodding at his mom or his pops, he made what may be the greatest Price is Right comment ever. I want to say, all of the sick kids at home, staying home from school, this is for you. This was a dream of mine. Having grown up well before DVR and streaming TV was available, I can say that getting my name called on The Price is Right has always been a dream of mine, just as it was a dream for Josh. Speaking of living out your dreams, soon after the contestant made that adorable comment, he actually landed on the $1.00 spot, which meant he nabbed the Showcase winnings, too. If you pay attention, Carey even gets a sly comment in about how George’s winnings were all for the sick kids staying home from school. There’s a lot of chance in game shows like this one, but when things do work out well for a particularly likable contestant, we can all get behind the moment. I mean honestly, tell me this celebratory shot doesn’t make you at least a little happy? The current version of The Price is Right has been on the air since 1972 and is responsible for a lot of classic TV moments like this one. Luckily, it doesn't look to be going anywhere, anytime soon. For great moments like these, check your local listings for when the game show airs. And be sure to also check out what else TV has coming up with our summer TV premiere schedule.